Japanese Geisha have their roots in female entertainers such as the Saburuko of the 7th century. 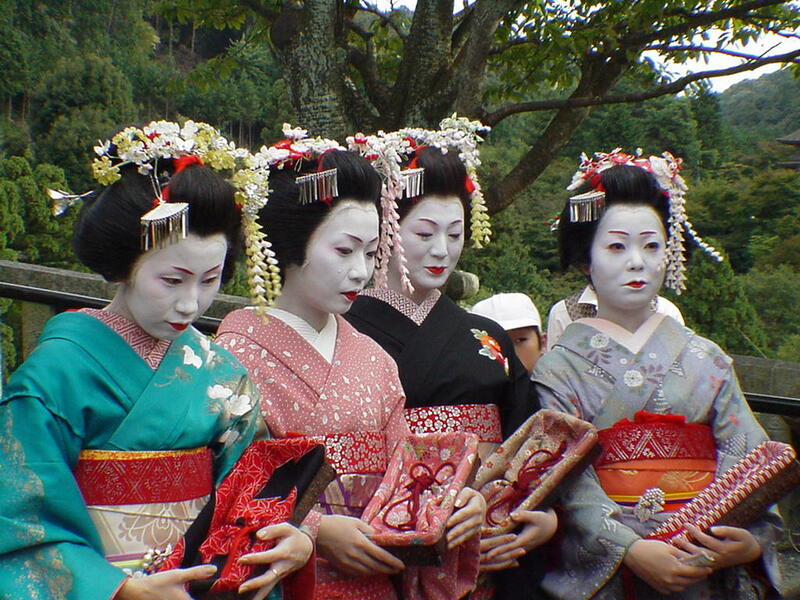 Japanese Geishas performs for the nobility and concubines to the emperor. The first walled-in pleasure quarters were built in Japan in the 16th century. In the Japanese culture, they were modeled after those of Ming Dynasty China. After they were relocated in the mid-1600s, they became known as Shimabara (after a fortress in Kyushu). Meanwhile a marshy patch of land (Yoshi-wara) in Edo had been designated as the site for a brothel district under the auspices of the Tokugawa shogunate. Strict rules such as brothels and the like were not allowed to operate outside the district. Among these rules were that no customers were allowed to stay in a brothel for more than 24 hours. Any suspicious or unknown visitors were to be reported to the Office of the City Governor. With Japan enjoying a long-awaited period of peace following centuries of civil war, many samurai found that society no longer had such need of their services. It's thought that many daughters of these formerly noble families became courtesans, with the result that quarters such as Yoshiwara and Shimabara were places of refinement and culture. Peace also brought an increase in prosperity and the rise of the merchant class, or chonin. Add that to the presence of artists and an atmosphere free of the strictures of the outside world, and it truly was something of an adult amusement park, with culture thrown in for good measure. Within the hanamichi there were many different classes of courtesans, and over the decades the hierarchy and the standards expected of them changed many times, not always for the better. The situation deteriorated in the mid-18th century to the extent that a new form of entertainer emerged in Kyoto and Osaka. The earliest geiko were men, while the first females, who appeared shortly after, were odoriko (dancers) or played the shamisen. Female geisha soon became popular enough to be able to steal clients from the courtesans, and in the case of Yoshiwara it was decided to start a kenban, or registration system, to keep them under control and force them to pay taxes. It strictly controlled their dress, behavior and movements and was considered so successful that it quickly became the norm at hanamichi across Japan. These strict rules in fact allowed the geisha to flourish as artists and entertainers. Though more simply dressed than the courtesans, they became regarded as fashion leaders. But many aspects of the lifestyle itself were less glamorous. Young girls were sold into the geisha life by their families until the mid-20th century and were often subject to the ritual of 'mizu-age,' whereby their virginity was sold to the highest bidder. Such practices were eradicated after World War II and the geisha profession went into a steady decline. Today, if Japanese geisha are hired to entertain at a private party outside the upper echelons of society, they are most likely to be seasoned veterans, more akin to your favorite aunt or even grandmother than the girl next door.